What better way to celebrate a sterling performance in Athens in 2004 than to gather in the Lake District in typical April weather for a couple of games, LX comradeship and an evening of reminiscing. Gathering for an opening game against a Cumbria Masters XI , and lining up with no less than 13 of the original squad the game began between the showers. 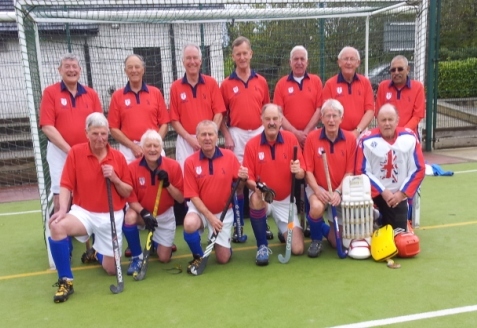 It was soon apparent that the younger legs of the Cumbrians were going to cause problems and before the Veterans had got into their stride, they found themselves a goal down. Laurie Alcock on the right and Terry Mills on the left were providing the outlet for George Hazell and Hugo Rowbotham while Graham George and Tony Jones were finding space in the opposing half and a couple of raids down the right brought the Master’s ‘keeper into action. With the Master’s defence being strengthened? by the inclusion of John Longden, it was always going to be a difficult task to score whilst keeping the opposition out and the LXer’s found themselves 2 goals down as the half time whistle blew. The second period began much as the first with the LX side endeavouring to recover from the half time break. Robin Mayes was prominent on the right whilst Colin Pearce and Parmodh Sharma assisted by Bob Clarke threatened to reduce the arrears. The re-union then moved on to the Castle Green Hotel in Kendal where a first class meal was served in the Kendal suite. Andy Holden welcomed all attendees and Nigel Strofton, captain of the medal winning side responded. All present expressed their thanks to Anne and Andy Holden for organising the occasion. Many amusing moments from the time in Athens were recounted and photographs were taken to commemorate the occasion. Determined to get back on terms, the Cumbria Master’s continued with a patient build up but George Hazell, Nigel Strofton and John Longden proved a solid back partnership and LX moved further ahead when George Hazell got his second of the game, again finding the backboard with a copy of his first half effort. In spite of Cumbrian attempts to force their way back into the game, the final whistle went with LX comfortable winners. Both teams retired to Alexander’s Pub for after match refreshments before the party broke up and another great weekend went into the LX memory bank. Attendees; T. Pollard, R.Clarke, T Jones, Mr & Mrs N Strofton, Mr & Mrs G Hazell, Mr & Mrs H Rowbotham, Mr & Mrs R Mayes, Mr & Mrs T Mills, Mr & Mrs C Pearce, Mr & Mrs L Alcock, Mr & Mrs G George, Mr P Sharma and Guest. David Wright who managed the LX side in Athens was also unable to attend.